Friskies Cat Food 16lbs., Purina Cat Chow 16 lbs., or Tidy Cats Litter 35lbs. Target rocks this week with all the sales. I even made 2 trips! The Fiber One Deal is even sweeter if you buy Fiber One Yogurt and Cereal. I will post a scenario shortly. Of course, you could mix and match the yogurt, cereal, and granola bars to fit your coupons and needs. I think I will avoid Target this week. I don’t see any deal that will make it worth a trip over there. Since I didn’t want you to miss out on any deals, go to Attention Target Shoppers for this week’s match-ups (as boring as they are). 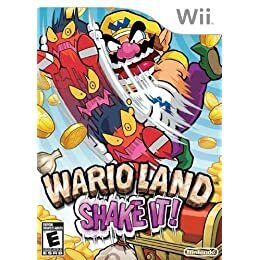 Target.com is selling Wario Land Shake It for Wii for $19.99 – that’s a $30.00 discount. It normally sells for $49.99. If you go through eBates first, you will receive an additional 3% back ($0.60) by rebate plus if this is your first purchase with eBates, you will receive an additional $5.00 back by rebate – making the price of this game only $14.39.